The great thing about this skillet is that we can brown the meatballs on the stove and then bake them, all without switching a pan…..the results are incredibly tender and tasty meatballs just like your Nonna used to make…check it out! Meatballs are an American classic found on the dinner tables of families across the nation. Why? Because, they’re easy to make AND delicious too – the hallmarks for comfort food everywhere. One of the reasons Parmesan meatballs are so easy to make is because they’re so versatile – you’re really only limited by your own creativity. Oh, and meat…you’ll need that….they are meatballs so the meat is kinda important. In this video recipe we’re using beef but there’s a ton of different ingredients that can be used to make really unique tasting outcomes. 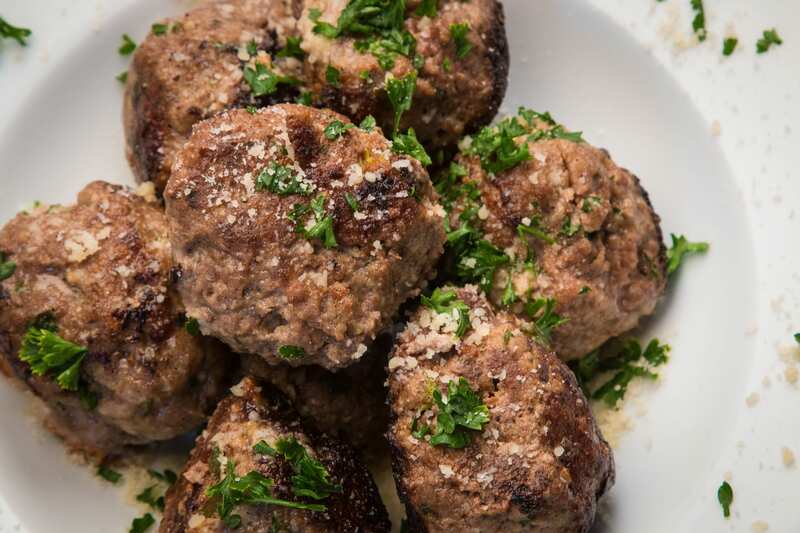 Pork, veal, and lamb are other common ingredients for making meatballs. Roll into meatballs – I like mine about the size of tennis balls. This should make about 8 – 10 meatballs. Once skillet is heated, place meatballs in and reduce heat to medium-high heat. Remove and sprinkle some more parmesan cheese on top for good measure. Serve with some sgetti and sauce and boom! You’ll be crushing dinner time like never before. These are very tender and tasty, perfectly cooked….your peeps will love them for sure. Not only are they easy to make, but they’re the perfect leftover too. In this video we'll share our easy recipe for tasty parmesan loaded meatballs cooked in a cast iron skillet. And the cast iron is the real key here… The great thing about this skillet is that we can brown the meatballs on the stove and then bake them, all without switching a pan…..the results are incredibly tender and tasty meatballs just like your Nonna used to make…check em out! Roll into meatballs - I like mine about the size of tennis balls. This should make about 8 - 10 meatballs. My meatballs crumbled in the pan when I tried to flip them. That’s the worst! Sorry to hear that…what type of skillet did you use? What do you think caused them to crumble?